Custom Rack for my Live PA Gear! I am super excited about my friend Vegas vegas@toursupply.com who works for toursupply.com setting me up with a custom cabling and rack system for my livePA's. You all have seen basically what my rig is and looks like in earlier posts. But when he asked me to come in to explore some custom cabling, at first I was like, hmmm, well, I pretty much do it myself. Living in my small music store world, I buy the cables and connectors I need (or at least close to the size I need) I set everything up, plug in all the audio (about 16 cables) all the midi (about 8 cables) and all the power (about 8 "wall wart" DC adapters plus some AC plugs) into all my gear, in the right places, and into the back of my rack. This whole initial process takes a few hours to get just right. 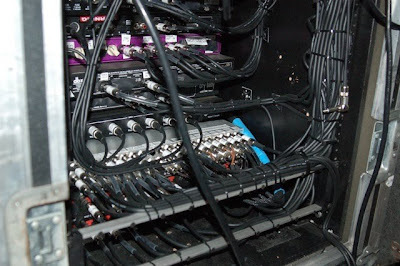 Then to speed setup and setdown, I leave all the cables connected into the back of my portable rack space along with the power all plugged in to powerbars also in the back of the rack space and then label the leads that connect to the equipment. This way, when I set up, I spill the spaghetti out of the back of the rack and plug into all my small instruments according to the lables, etc. Takes about 25 minutes of really paying attention and focused work and I am set up. Set down is 10 minutes.... Ah, who am I kidding, add 10 minutes to each step if I am being honest. And if something is wrong, oops! Go back and check that any of the cables haven't popped out of the equipment in the rack, or a adapter fallen out of its socket (I use ducktape to try and keep everything secure as it rolls down the sidewalk, and bounces in the truck of a cab, etc, -- forget about flying, when I went to Burning Man, you basically have to start over after the luggage handlers (not to mention the TSA--yes I did find a little note in my rack about them looking in) have their way with it. Pretty much, after, um, a lot of years of doing this, in various band formations, etc, I think my system is about as compact, very versative for writing and performing and efficient for trasporting and setting up and setting down as I can make it. And it is until . . . I go in and start talking with Vegas and after a few minutes it dawns on me when I get my head away from the idea of using stock parts to do the best you can (which is what I have been doing all these years) that he is not just talking about making a custom snake (i.e. all the cables bunched together and have each synth or module have the 4-5 cables it needs leading to it, etc, (which is amazing enough) but also replicating all my power supplies inside the cabinet and replicating the inputs and outputs of my system on the back of the rack so that even nearly asleep I can just plug matching plugs into the back of the rack in 2 minutes and then each of the matching labeled plugs into each device in about 5 or 10 minutes. This may not seem like much savings of time, but the main thing is that it is near brainless, all the connectors are locking so no cables falling out, there are no more and no less connectors and plugs than necessary and you can do it over and over and over again with minimal wear and tear and leaving the sole mistakes to simply ignoring labeling, as opposed to actually having to know how and why which plug goes where. Sometimes the small conveniences of life make a huge difference and this is sure one of them. I mean, now I can at least conceive (if not ever achieve) of having someone else set my stuff up. holy moly . . . as I drift off into the imaginary musician nirvana for 99 percent of us where you don't have to do *everything* yourself . . . Okay, so that's not happening, but I can make life for my roadie, me, a lot easier! I need to be good to my staff! And I will love me for it. Mike builds customs anything for large touring acts including Aerosmith, Peter Frampton, Moby, etc. The picture above is the back of one of Peter Frampton's small racks. I learned that there are only about 5 custom shops in the world that do this. To recap, he is currently building me a custom rack with my AD converters, complete internal power supplies for my outboard gear, with locking connectors on the back of the rack for all audio in, out, AC in and DC outs to a snake to each of my pieces. Basically means quick less error prone setup and setdown in minutes for my live PA rig which includes laptop, 2 motu devices, Emu Command Station, Future Retro Revolution, Waldorf Blofeld, Elektron Machine drum, novation controller and a Korg Kaoss Pad. All will fit into a snug flight case with my computer and couple small things in my backpack. One of the key things about this rig for me is that I will not have to use my stock wallwarts, but will have all covered internally. This way, I can leave my stock wallwarts in my main studio at home when I take my things out to gig. Huge savings of time and hassle. It costs, but truly not nearly as much as I though and the reality is once you have the gear you want, this is the way to go. I haven't been this excited about my setup in a long time. If this sounds like anything that makes sense in your life full of cables and connectors, then give Mike a shout! I am a little behind on posts. First of all I want share that I performed in Greenpoint again at this rave. Very cool with the main djs for the large dancefloor and then me in the lounge with the bar and couches and dance area along with the projector with audience malleable graphics. Just like the original NOISION gigs in williamsburg 10 years ago! The room was mine and I performed for nearly 3 hours non-stop. Will get some recordings up later. It sounded good to me! But with nearly 3 hours of material, I want to tweak out some of the better parts. Even I don't have 3 hours to listen most of the time!